KTER Center researchers Kathleen Murphy and Rebecca Gaines presented. 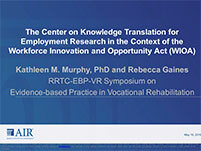 The KTER Center's mission is to promote the use of employment research findings to improve practices and policies that support improved employment outcomes of individuals with disabilities. This session presented preliminary findings regarding: 1) the Central Role of VR supervisors in promoting evidence-based practice; 2) Research Track on Transition-aged Youth; 3) Research Track on VR Outreach to Business; 4) Research Track on Adults with Autism. Audience members participated in a lively discussion, offering their feedback and suggestions regarding these findings and how best to share them with senior VR counselors.